I am by no means a Photographer at all, but I do love to take lots and lots of pictures. Most of my photos are of my two year old son Raylan and of nature. I also like having Raylan's pictures took by a professional photographer especially during the holidays but I hate the price tag that comes along with it. So I invested in a decent DSLR camera and started taking his holiday photos at home. I have the Canon Rebel T5 and I absolutely love it. It's the best investment I have ever made. However, If you have a smart phone or a decent bridge camera you can take great photos as well. Like I said, I don't like paying the high price for Holiday Mini Session Photos. So I try to be creative and go with a theme and do holiday photos myself. 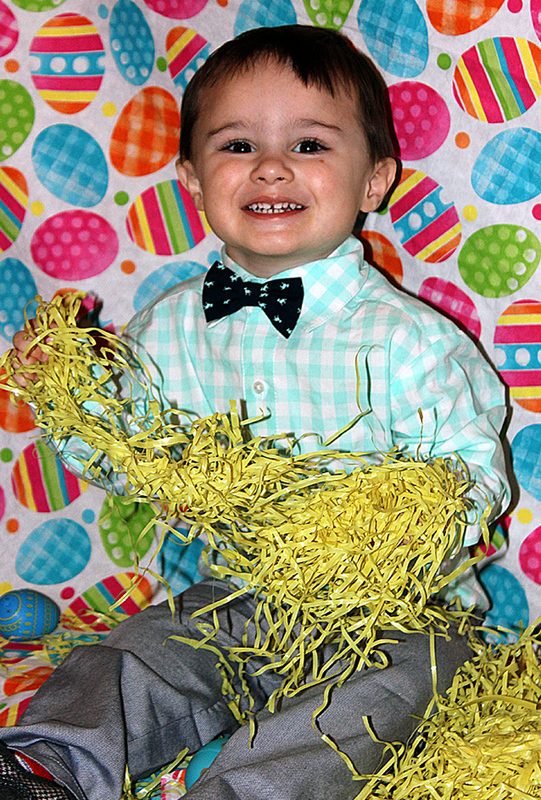 The week leading up to Easter this year was chilly so I did some of Raylan's Easter Photos inside. The background you see here is a 0.50 cent Easter tablecloth that I purchased at a yard sale. I thought it was too cute and for 0.50 cents I couldn't pass it up. I knew it would look great on my table for my Easter decor, but I also had an Idea. Why not use it for a photo backdrop? I pinned the tablecloth to one of my walls. 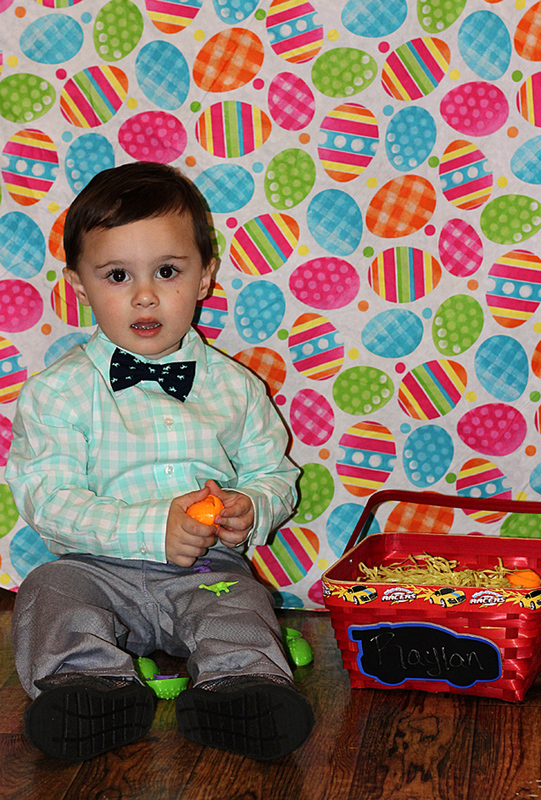 I dressed him in his Easter Sunday outfit and placed him in front of the backdrop along with his Easter Basket. 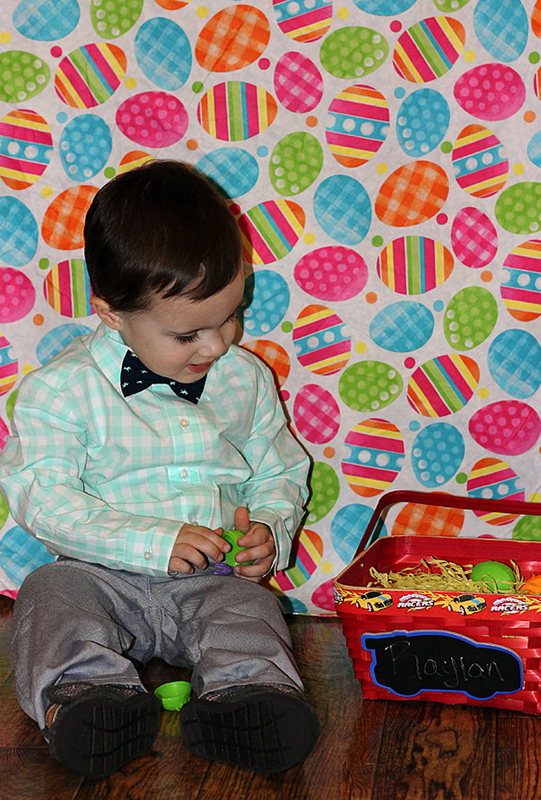 The dinosaurs you see here are from his Dinosaur Easter Eggs. He had to tear into them. He is such a dinosaur lover! I just started snapping and tried to capture every little moment. This one is my favorite. I absolutely love it. I gave him some Easter grass and he had so much fun with it. It was a mess to clean up but he had so much fun throwing it everywhere. Just look at that smile. 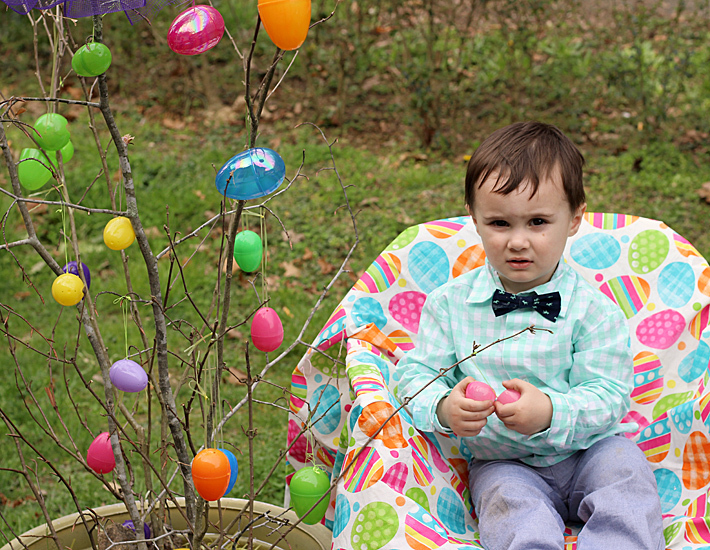 On Easter Sunday it was a bit warmer, so I took the tablecloth outside and placed him by the Easter tree that we had decorated. I love outdoor photos so much better. The lighting and scenery is just so much better and easier to work with. Easter Eggs everywhere. I just love all of the bright colors. 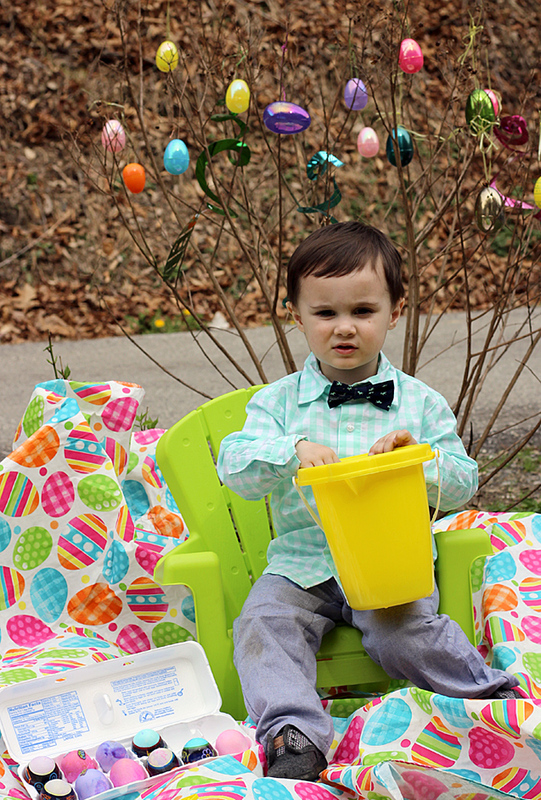 You can definitely tell that this is an Easter themed photo shoot. This one is also a favorite of mine. I snapped this photo while he was in the moment of finding his eggs. 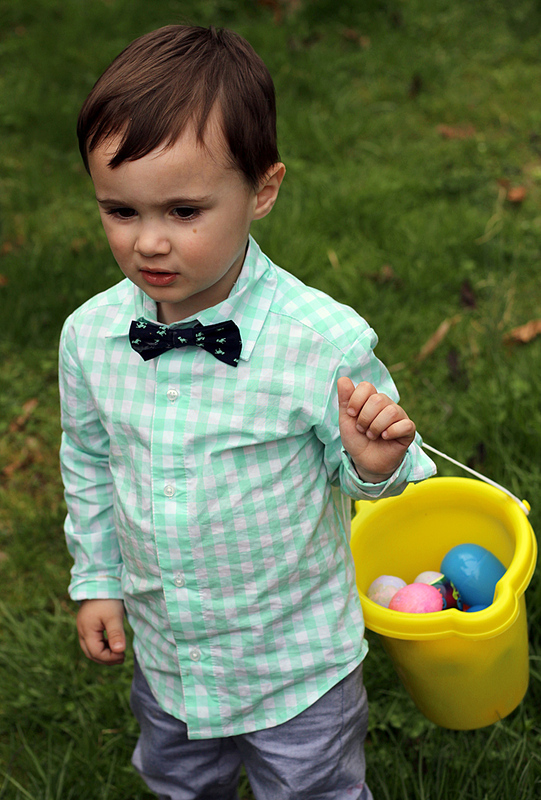 I love the brightness of this photo and I love how I captured the moment of him on his search to find eggs. *You can't always get a toddler to look at you so most of the time you have to capture them in the moment of doing something. These always make the best photos! You also don't have to spend a great deal of money to make photos look great. Invest in a Camera or Smart Phone and use a photo editing software. I use Photoshop Elements 13 which is my favorite, but if I'm in a hurry and just need simple edits I use PicMonkey which is a free online version to edit your photos. For $4.99 a month you can upgrade to the full version of PicMonkey which gives you a few more options to work with, however, the free version offers a lot. If I'm using my smart phone, I like to use the app Camera + to edit my photos and I also use Instagram to edit. For Instagram, I love playing with the highlights and brightness to really make my photos pop. So If you're like me and on a budget, taking holiday photos at home is your best option. Just be creative. Try to shoot photos outside but if that's not possible then find a good background and add a few details around your child like the Easter Eggs and basket and start snapping away. There is no reason to pay such a high price when you can make your photos look great at home.